This list of events on this web page is showing you the SPECIAL events out at the refuge, but you are welcome to visit on any day of the week, during daylight hours. Even during the hours when the Conservation Learning Center and the Visitor Center are closed, you can still enjoy nature. March 23, 2019 10am-1pm - Kids’ Fishing Day, hosted by CCA (Coastal Conservation Association). FoBB will provide two activity tables, including fish printing and aquatic invertebrate viewing. Kids can learn about the microscopic critters living in the water. March 30, 2019 8am - First Pollinator Garden Workday - volunteers do general work and volunteer to adopt a spot. April 6, 2019 - First Saturday Kids Day, which will center on planting in the garden. April 10, 2019 - 3-6 pm, Listen to KEDM for FoBB members manning the phones! FoBB loves our community! FoBB will set up an information table (membership) and a children’s activity. The plan is to have bookmarks for children to color and sign a pledge not to litter. Pollinator information too! April 22, 2019 - 6:30 pm - New Alligator Exhibit Grand Opening celebration of the renovated CLC Exhibit Room Speakers including Kelby Ouchley to give a post-opening presentation about alligators while Nova Clarke will lead a simultaneous refuge walk for children and others. 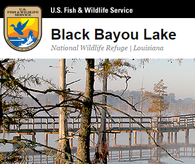 the US Fish & Wildlife's BBLNWR at Black Bayou is on their Facebook Page HERE. Nova Clarke is the U.S. Fish and Wildlife Service's Refuge Ranger/Interpretive Naturalist at Black Bayou Lake National Wildlife Refuge. Call Nova at (318) 387-1114 to schedule a field trip or find out more about events.